Harvard College (Advanced Standing), Cambridge, MA, 1990. University of Pennsylvania School of Medicine, 1994. Johns Hopkins Bloomberg School of Public Health, Baltimore, MD, 2001. 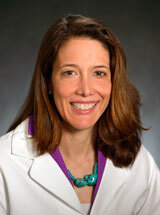 Anne Rentoumis Cappola, M.D., Sc.M. is a Professor of Medicine in the Division of Endocrinology, Diabetes, and Metabolism; Director of the CTSA-sponsored Center for Human Phenomic Science; and Director of Clinical Research for the Department of Medicine. She is an Associate Editor for the Journal of the American Medical Association (JAMA). Dr. Cappola leads an NIH-funded program focusing on the hormonal alterations that occur with aging and the clinical impact of these changes Current projects include studies of the indications for treatment of subclinical thyroid dysfunction in older men and women; the role of androgens in the health of older women; hormonal treatments for the frailty syndrome; and metabolic changes in men and women who sustain a hip fracture. Dr. Cappola's research focuses on the hormonal alterations that occur with aging and the clinical impact of these changes, including hormonal contributions to the frailty syndrome, and the clinical impact of subclinical thyroid disease in older individuals. Meuwese CL, van Diepen M, Cappola AR, Sarnak MJ, Shlipak MG, Bauer DC, Fried LP, Iacoviello M, Vaes B, Degryse J, Khaw KT, Luben RN, Asvold BO, Bjoro T, Vatten LJ, de Craen AJM, Trompet S, Iervasi G, Molinaro S, Cersini G, Ferrucci L, Dullaart RPF, Bakker SJL, Jukema JW, Kearney PM, Stott DJ, Peeters RP, Franco OH, VOlzke H, Walsh JP, Bremner A, Sgarbi JA, Maciel RMB, Imaizumi M, Ohishi W, Dekker FW, Rodondi N, Gussekloo J, den Elzen WPJ for the Thyroid Studies Collaboration: Low thyroid function is not associated with an accelerated deterioration in renal function. Nephrol Dial Transplant 34(4): 650-659, Apr 2019. Sanders JL, Arnold AM, Boudreau RM, Hirsch CH, Kizer JR, Kaplan RC, Cappola AR, Cushman M, Jacob ME, Kritchevsky SB, Newman AB: Association of biomarker and physiologic indices with mortality in older adults: Cardiovascular Health Study. J Gerontol Med Sci 74(1): 114-120, Jan 2019. Mulheren RW, Humbert IA, Cappola AR, Fried LP, González-Fernández M : Taste perception and swallow screen results in old-old women Geriatrics In press 2019. Ellervik C, Roselli C, Christophersen IE, Alonso A, Pietzner M, Sitlani CM, Trompet S, Arking DE, Geelhoed B, Guo X, Kleber ME, Lin HJ, Lin H, Macfarlane P, Selvin E, Shaffer C, Smith AV, Verweij N, Weiss S, Cappola AR, Dörr M, Gudnason V, Heckbert S, Mooijaart S, Marz W, Psaty BM, Ridker PM, Roden D, Stott DJ, Völzke H, Benjamin EJ, Delgado G, Ellinor P, Homuth G, Köttgen A, Jukema JW, Lubitz SA, Mora S, Rienstra M, Rotter JI, Shoemaker MB, Sotoodehnia N, Taylor KD, van der Harst P, Albert CM, Chasman DI : Assessment of the relationship between genetic determinants of thyroid function and atrial fibrillation: a Mendelian randomization study. JAMA Cardiol In press 2019. Varadjam R. Russ DW. Gabr RE, Huang J, Kalyani R, Xue QL, Cappola AR, Bandeen-Roche K, Fried LP: Relationship of physical frailty to phosphocreatine recovery in muscle after mild exercise stress in the oldest-old women. J Frailty Aging In press, 2019. Kannan L, Shaw PA, Morley MP, Brandimarto J, Fang JC, Sweitzer NK, Cappola TP, Cappola AR: Thyroid dysfunction in heart failure and cardiovascular outcomes. Circ Heart Fail 11(12): e005266, Dec 2018. Wopereis DM, Du Puy RS, van Heemst D, Walsh JP, Bremner A, Bakker SJL, Bauer DC, Cappola AR, Ceresini G, Degryse J, Dullaart RPF, Feller M, Ferrucci L, Floriani C, Franker OH, Iacoviello M, Iervasi G, Imaizumi M, Jukema JW, Khaw KT, Luben RN, Molinaro S, Nauck M, Patel KV, Peeters RP, Psaty BM, Razvi S, Schindhelm RK, van Schoor NM, Stott DG, Vaes B, Vanderpump MPJ, Volzke H, Westendorp RGJ, Rodondi N, Cobbaert CM, Gussekloo J, den Elzen WPJ for the Thyroid Studies Collaboration: The relation between thyroid function and anemia: a pooled analysis of individual participant data. J Clin Endocrinol Metab 103(10): 3658-3667, Oct 2018. Teumer A, Chaker L, Groeneweg S, Li Y, Di Munno C, Barbieri C, Schultheiss UT, Traglia M, Ahluwalia TS, Akiyama M, Appel EV, Arking DE, Arnold A, Astrup A, Beekman M, Beilby JP, Bekaert S, Boerwinkle E, Brown SJ, De Buyzere M, Campbell JP, Ceresini G, Cerqueira C, Cucca F, Deary IJ, Deelen J, Eckardt KU, Ekici AB, Eriksson J, Ferrucci L, Fiers T, Fiorillo E, Ford I, Fox CS, Fuchsberger C, Galesloot TE, Gieger C, Gögele M, De Grandi A, Grarup N, Greiser KH, Haljas K, Hansen T, Harris SE, van Heemst D, den Heiger M, Hicks AA, den Hallander W, Homuth G, Hui J, Ikram MA, Ittermann T, Jensen RA, Jing J, Jukema JW, Kajantie E, Kamatani Y, Kasbohm E, Kaufman JM, Kiemeney LA, Kloppenburg M, Kronenberg F, Kubo M, Lahti J, Lapauw B, Li S, Liewald DCM, Lifelines Cohort Study, Lim EM, Linneberg A, Marina M, Mascalzoni D, Matsuda K, Medenwald D, Meisinger C, Muelenbelt I, De Meyer T, Meyer zu Schwabedissen H, Mikolajczyk R, Moed M, Netea-Maier RT, Nolte IM, Okada Y, Pala M, Pattaro C, Pedersen O, Petersmann A, Porcu E, Postmus I, Pramstaller PP, Psaty BM, Ramos Y, Rawal R, Redmond P, Richards JB, Rietzschel ER, Rivadeneira F, Roef G, Rotter JI, Sala CF, Schlessinger D, Selvin E, Slagboom PE, Soranzo N, Sørensen TIA, Spector TD, Starr JM, Stott DJ, Taes Y, Taliun D, Tanaka T, Thuesen B, Tiller D, Toniolo D, Uitterlinden AG, Visser E, Walsh JP, Wilson SG, Wolffenbuttel BHR, Yang Q, Zhen HF, Cappola A, Peeters RP, Naitza S, Völzke H, Sanna S, Köttgen A, Visser TJ, Medici M, on behalf of the ThyroidOmics Consortium: Genome-wide analyses identify a role for SLC17A4 and AADAT in thyroid hormone regulation. Nat Commun 9(1): 4455, Oct 2018. Sanders JL, Guo W, O’Meara ES, Kaplan RC, Pollak MN, Bartz TM, Newman AB, Fried LP, Cappola AR: Trajectories of IGF-I predict mortality in older adults: the Cardiovascular Health Study. J Gerontol A Biol Sci Med Sci 73(7): 953-959, June 2018. Peterson SJ, Cappola AR, Castro MR, Dayan CM, Farwell AP, Hennessey JV, Kopp PA, Ross DS, Samuels MH, Sawka AM, Taylor PN, Jonklaas J, Bianco AC: An online survey of hypothyroid patients demonstrates prominent dissatisfaction. Thyroid 28(6): 707-721, Jun 2018.